Year : 2002. Individual/Single Card. Make: Winning Moves. This is for the sale of a Lord of the Rings Trading Card Binder and base set. Year : 2003. Individual/Single Card. The Desolation of Smaug. The Hobbit. Bain son of Bard. Autograph Card. This is a single card from this product release. NSU Magazine Promo Card P7. The Hobbit The Battle Of The Five Armies Trading Card. Promo card released by Cryptozic. The TWO TOWERS UPDATE. LORD of the RINGS. LORD of the RINGS. THE CARD IS IN M/NM CONDITION. THE DESOLATION OF SMAUG. INGRID HARDY PAINTED SKETCH CARD OF SMAUG. THE HOBBIT. THE CARD IN THE PICTURE IS THE CARD YOU WILL RECEIVE. Aiden Turner as Killi The Dwarf AT. The Hobbit The Battle Of The Five Armies Trading Card. Autograph card released by Cryptozic. THE DESOLATION OF SMAUG. DANNY SILVA SKETCH CARD OF BAIN SON OF BARD. THE HOBBIT. THE CARD IN THE PICTURE IS THE CARD YOU WILL RECEIVE. Desolation of Smaug. The Hobbit. 72 Card Base set. This is a card set from this product release. LORD OF THE RINGS. COMPLETE BASE SET OF 72 CARDS. Fer Galicia. The Hobbit Battle Five Armies. Sketch Card. This is a single card from this product release. THE SKETCH CARD IN THE TITLE & PICTURE IS THE SKETCH YOU WILL RECEIVE. EVOLUTION 2006. LORD of the RINGS. 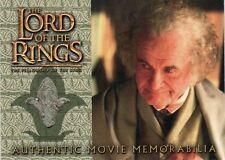 IAN HOLM AS BILBO AUTO CARD. LORD of the RINGS. BERNARD HILL AS THEODEN AUTO CARD. the TWO TOWERS. LORD of the RINGS. RARE VIGGO MORTENSEN AS ARAGORN AUTO CARD. the TWO TOWERS. LORD of the RINGS. DAVID WENHAM AS FARAMIR AUTO CARD. LORD of the RINGS. THE CARD IS IN M/NM CONDITION. C14 Erestor, Chief Advisor To Elrond. Where we think that the card is a genuine variant we will clearly state in the title "variant". ON OFFER IS A TYPE CARD ISSUED BY DECIPHER IN 2002, THE LORD OF THE RINGS. NUMBER 4C210 , EVENT, WE ARE THE FIGHTING URUK HAI, SKIRMISH : MAKE AN URUK -HAI STRENGHT 2 ( AND DAMAGE 1 IF YOU CONTROL A SITE ) " BUT FOR US YOU'D ALL HAVE RUN AWAY" . CARD IS IN EXCELLENT CONDITION AND SUPPLIED WITH PROTECTIVE SLEEVE. SOLD AS SEEN IN PHOTOS. WE WILL BE OBTAINING PROOF OF POSTAGE BUT CANNOT BE RESPONSIBLE FOR LOSS OR DAMAGE CAUSED IN POST THANKYOU FOR LOOKING HAPPY BIDDING. ..
Evangeline Lilly as ‘Tauriel’ EL. The Hobbit The Battle Of The Five Armies Trading Card. Autograph card released by Cryptozic. Lord Of The Rings CCG Foil Card TTT 4. U253 Southron Sentry. Where we think that the card is a genuine variant we will clearly state in the title "variant". Lord Of The Rings CCG Card MD 10. C81 Cirith Ungol Guard. Where we think that the card is a genuine variant we will clearly state in the title "variant". Country/Region of Manufacture United States. Nous ne avons jamais (croisons les doigts) avaient un point de se perdre l'utilisation de ces deux méthodes. À propos de nous. NSU Magazine Promo Card P6. The Hobbit The Battle Of The Five Armies Trading Card. Promo card released by Cryptozic. Of Ian Holm who played Bilbo Senior in the film.